The stars picture for New Years makes me think about it's potential symbolism. New starts? The passage of time? Max is the only one there who's face we can't see. Perhaps that alludes to him hiding his emotions, or concealing motives... The positioning of his knees leaves me with the impression he's still quartering himself off, staying on guard- defensive. Perhaps he's in need of comfort, but unwilling to admit it? Ed appears to be expressing a state of catharsis, acceptance, living in that moment and reflecting on all that he's experienced, feeling how small it is under the weight of cosmic majesty (Dibs on the band name Cosmic Majesty). How incredible that must feel. Does this mean that we'll be seeing him letting go of his fear, his anxiety over Isabel's 'anger' he percieves? I'd like to think so. Rick looks... hrm. His expression is tricky. It's as though something still weighs on him, but the joyous moment has pulled him free from that darkness if but for a moment- could the nighttime scenery depict him accepting something grim, and similar to Ed being released from it's mental burden? He conceals his hands, but is it for warmth or a gesture that he, too, continues to conceal his emotions? As he stands with his feet planted behind the horizon of the shot, are we to suspect he is distancing himself, or could this be simple artistic rendering to keep Isabel's upward point as the 'eye grabber' of the silhouette? Is the steam from him alone to indicate a sigh specific to his character arc? Is it one of relief? Appreciation? Isabel and Isaac, however, seem to be much more relaxed. Joyous, grinning, Isaac's uptilted gaze an expression of pure childlike glee, a rare moment of raw emotive appreciation from our sullen representation of him. It harkens back to his demeanor with Max at their first meeting- unabridged excitement and acceptance . What could this foreshadow? How will they make up? What pieces of this puzzle am I going to be handed in coming chapters?! I'm reading into this a lot more than I probably should. I think part of why they're looking at the sky may have been because the night of January 1st was a supermoon. The way I see the picture is that the Activity Club is out having a nice time with each other, in a moment of relative calm that they haven't gotten recently. Hijack sure knows how to make an exit. Also. W got to see the effects of a spirit speaking through their host emitting a double-indicated speech bubble again. It hasn't happened since MaxBERG intimidated Dooman. Where there was once speculation that the spirit in Max may have uniquely had two voices, we now see that's just how it works when a Spirit talks through their host. I really want Dimitri's Necromantis shirt.. I feel so bad for Mr.Spender ;-; He's just left completely in the dark about what happened, and he doesn't even remember that Isabelle lost Eightfold on the train ride. WHY is THIS MAN so bloody creepy!? OH MY GOODNESS I CANNOT TAKE IT. what a villain. A crazy, evil, demented villain if ever I saw one. Jeez. Just, the way the lighting changes in the last panel, his crooked smile, the crazy hair I mean COME ON. Even student council knows to stay away from him. I really hope our kiddos stay away from him too, but at the same time, I wanna see more of this guy. I mean, come on, he's so over-the-top. It's creepy, but wildly entertaining. You know, the chapter is called "The Insidious Infiltrator," but what if the insidious infiltrator wasn't the brain man...? I mean, insidious is defined as "harmful but enticing: seductive." 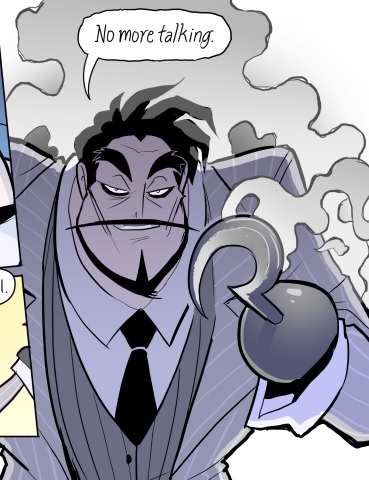 from the very beginning and I felt awfully proud about that being the case but not only do I LOVE THIS NEW VILLAIN but...! STUFF IS HAPPENING! Red Herring or do we finally have a semi answer to that mystery? Hahaha Apophyllite, I think you're onto something with that! The colors match! This chapter is SO GOOD! And the new revelation about Cody! I actually reread the whole comic today lol, got re-hyped for seeing Johnny's growth as he fully becomes a spectral! I think he meant to say "Our Student Council President's crazy father"??? He used his power to curve a sword????? I find this very neat tbh. Hot dangs I was thinking the same thing. He has shown space-bendy powers so maybe the bent a sword for convenient storage. The Lefty theory is the best one though. 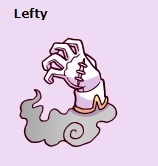 To elaborate: Lefty was described as a ghost who is missing the rest of their body. It implies that most of him was destroyed and a hand was severed. But perhaps Lefty's body (all but the left hand for some reason) was stolen by this vampirate man, who was dead and a ghost until he took the body over. The dead man's hand remains as a ghost because of it's thirst for VAMPIRE VENGEANCE. Really liking the panel separation in this one.